CM Magazine:Merry Christmas, Little Mouse. Toronto, ON: Scholastic Canada, 1995. Little Mouse was getting ready for Christmas. She hung up her stocking and wrapped her presents. She was looking forward to seeing Gran and Grandpa, who were coming to visit on Christmas Day. The only thing missing was snow. This book, like its fuzzy cover, makes you feel the warmth of Christmas. Little Mouse thinks everything is perfect for the holiday season except for the lack of snow. She wishes hard for snow, and her wish comes true. But the problem now is that it snows so hard that her Gran and Grandpa may not make it to her house for Christmas dinner. What is Little Mouse to do? The story captures the excitement and anticipation of Christmas while realistically relaying the fears of a child when things do not go as planned. However, the story is weakest at its climax when her friends, Little Robin, Little Sparrow, Little Fox, and Little Squirrel, magically appear out of nowhere to save the day. The essence of Christmas joy shines through in the illustrations with their festive colours. They are reminiscent of Hallmark Xmas cards - very pretty and dainty. The kids will especially enjoy feeling the pictures as some parts of them are raised. Furthermore, there are plenty of Christmas motifs, like gingerbread men, snowflakes, and gifts, peppered throughout the book to keep them entertained. Because of these reasons, the book is best suited for parents or caretakers to read with a child in an intimate moment but not for group storytimes at libraries. Though this picture storybook is gorgeous to look at and the story is decent, I think there are other holiday classics that parents, teachers, and librarians should consider first, books like Chris Van Allsburg's The Polar Express. But who knows? 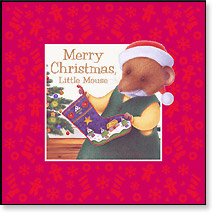 Merry Christmas, Little Mouse could become a child's favourite Christmas book. Min So is an on-call librarian at Vancouver Public Library.